The communities of the Annapolis Valley of Nova Scotia invite you to discover what makes our region a rewarding place to live, work and invest. Located along the Bay of Fundy – home of the world’s highest tides – the 150-kilometre-long Valley region is within easy reach of Nova Scotia’s international airport and its capital city Halifax, a major seaport. Quick access to short-hop flights to Boston and New York, and key international destinations such as London, Paris and Frankfurt, enables you to take your business to the world. The Annapolis Valley economic region, as defined by Statistics Canada, covers Annapolis, Kings and Hants counties on the northwestern seaboard of Nova Scotia. The Valley REN serves communities in the central part of this economic region. Outside of the Halifax Regional Municipality, the Annapolis Valley economic region (comprising Annapolis, Kings and Hants counties) is the province’s second largest economic force. Canmac Economics has forecast average GDP growth of 1.89% in this region for the period of 2018-2022, positioning the Annapolis Valley as growth leader in the rural regions of Nova Scotia. The Annapolis Valley also enjoys strong industrial and post-secondary educational assets and a vital entrepreneurial spirit. EXPERTISE in agriculture and manufacturing as well as a solid base of service and tourism. LOW COST LAND and affordable real estate costs. VERY COMPETITIVE BUSINESS TAX ENVIRONMENT as reported by KPMG Nova Scotia offers one of the lowest cumulative tax environments. ECONOMIC STABILITY strong fiscal environment and long term, stable inflation. LOYAL AND PRODUCTIVE WORKFORCE with employee turnover rates in Nova Scotia area among the lowest in North America. LOW COST LABOUR compared to U.S. jurisdictions. The Support and Services You Need For Growth and Success! BusinessNOW services are available at no charge to you. Our goal is to help you grow, progress and prosper! The Valley REN can connect you with the people and resources to start-up, grow, expand or sell your business in the Annapolis Valley. We provide one-on-one support to bring the Annapolis Valley Advantage to your business. We work with you to identify challenges and connect you with the people and resources to help overcome these barriers. How we can help make it happen! If you’re interested in the BusinessNow program, please email the Program Coordinator at info@valleyren.ca for more information. 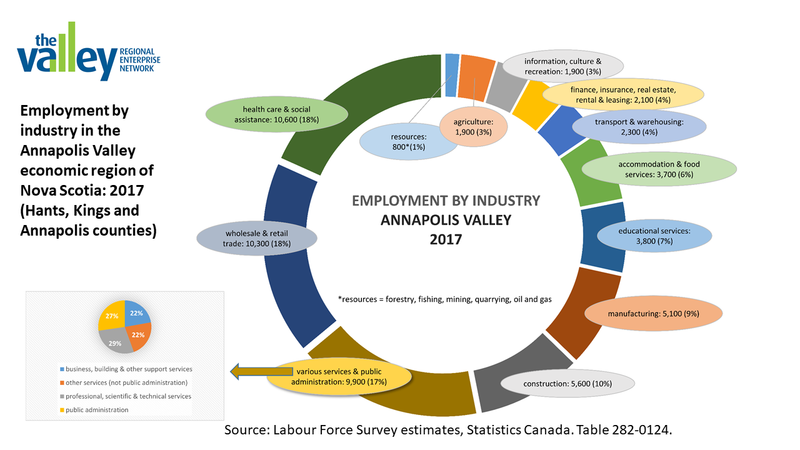 Employment growth was strong in the Annapolis Valley in 2017 compared with the previous decade. The Valley REN serves communities in the central part of the economic region and is home to just under 124,800 people (52,765 households). There are 3,487 businesses and institutions employing a total of 58,300 individuals. Just over half of establishments (55%) are in the private sector; 30% are in the goods sector and 10% are in the public services sector. The Annapolis Region boasts several large manufacturers including Michelin, Xerium, PepsiCo, Crown Fibre, and CKF. The majority of regional businesses are smaller in nature. 98% of establishments have 100 or fewer employees (small businesses) and 53% have less than 5 employees (micro businesses). FACT: A strong mixed skills labour force. 29% have a college or non-university diploma; 20% have a university certificate, diploma or degree. 25% have a high school degree or equivalent. The Valley Regional Enterprise Network (Valley REN) is leading a manufacturing taskforce to identify challenges faced by the manufacturing sector in the Annapolis Valley and to enable solutions for the sector’s continued success. It is our goal to identify and achieve consensus around three key issues which need to be addressed to enable the success of the manufacturers who are instrumental in creating prosperous and sustainable Valley communities. The Valley REN has laid out a plan and process to move from issue identification to activation. A Kick-Off meeting was facilitated in August 2018 to discuss common challenges and opportunities and to align around priorities to be tackled collectively as next steps.The Valley REN was joined by representatives from several of the larger manufacturers in our region, Labour and Advanced Education, Nova Scotia Business Inc (NSBI), Atlantic Canada Opportunities Agency (ACOA), The Annapolis Valley Chamber of Commerce (AVCC), the Valley Business Leaders Initiative (VBLI) and Canadian Manufacturers and Exporters (CME). The top challenges arising from the conversation were: Labour-development, attraction and retention; Energy – costs and reliability; and Regional Marketing & Awareness making both the Valley and Manufacturing attractive and trendy! On November 29, 2018, the Valley REN will host a Valley Manufacturing Taskforce Summit bringing together all the manufacturers and stakeholders who have engaged so far. The Valley REN will report on the results, as well as discuss implications and potential solutions.Work Group leaders and teams will be appointed to develop specific action plans. Benefit from strong innovation networks and research centres and a wealth of opportunity here in the Annapolis Valley. The Valley is experiencing exciting developments in agri-business, agri-tech and horticulture, smart building design, green energy financing, data analytics, and the use of topographic-bathymetric LIDAR (light detection and ranging) to map and study the ocean floor and improve environmental and municipal planning. Acadia is one of the top 5 under graduate universities in Canada and one of the oldest universities in Canada. For 25 consecutive years, Maclean’s has ranked Acadia as one of the top five undergraduate universities in Canada. With its nationally and internationally recognized undergraduate and graduate research initiatives, small classes and technology-rich teaching and learning environments, Acadia offers students an experience that includes academic achievement combined with personal growth and development. The Annapolis Valley offers a rich concentration of talent, post-secondary institutions and R&D services, with research centres at Acadia University, in Wolfville, and at Nova Scotia Community College, which has two campuses spread across three sites. in the Valley. Acadia University is one of the oldest in Canada and consistently ranks in the top five undergraduate universities in Maclean’s annual review. This university community is deeply engaged with business development activities through the Rural Innovation Centre (RIC). 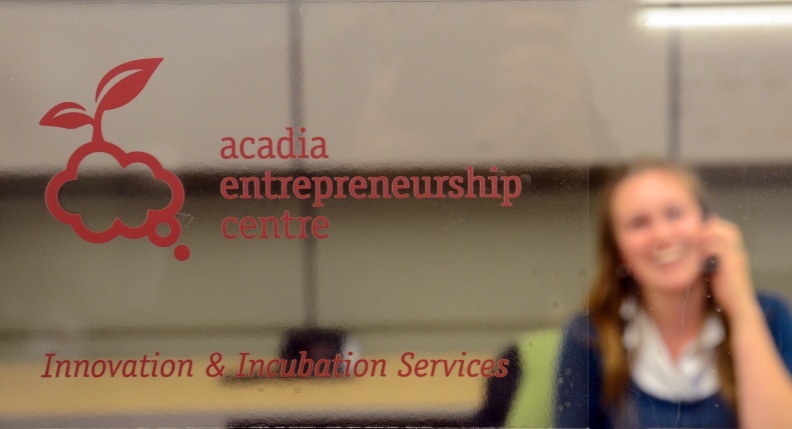 As an incubator for start-up companies, the RIC forms part of the Acadia Entrepreneurship Centre. Research-based tenants include the Acadia Institute for Data Analytics, Acadia Tidal Energy Institute, and Atlantic Wine Institute. The Annapolis Valley campus of the Nova Scotia Community College is home to the Geomatics Research Group, which uses topographic-bathymetric lidar (light detection and ranging) to map and study the ocean floor. The province-wide Nova Scotia Community College (NSCC) delivers sharply honed courses, diplomas, and advanced diplomas to prepare and build a skilled work force and support lifelong learning. It also offers customized training solutions for employers, giving them a competitive advantage. A new article from Maclean’s reveals the world-class research and technology taking place at the Annapolis Valley campus of the Nova Scotia Community College, which houses the Applied Geomatics Research Group. The campus is the only one in Canada equipped with topographic-bathymetric lidar (light detection and ranging) to map and study the ocean floor. This technology is being applied in aquaculture, oceans management, and environmental and municipal planning. 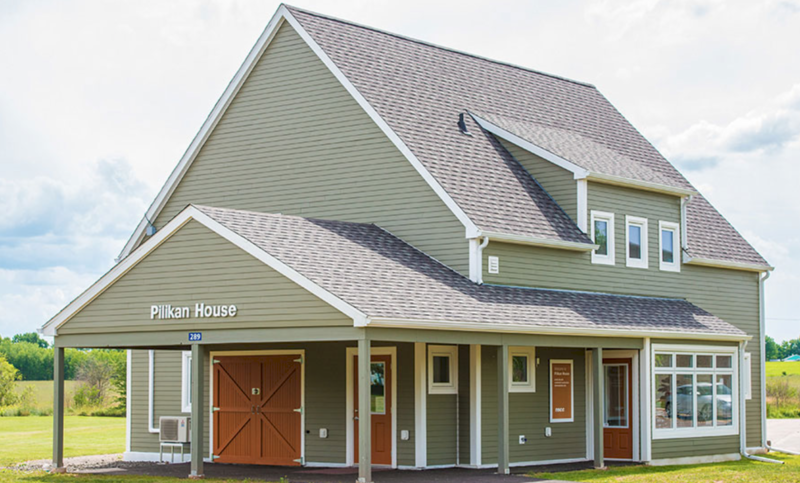 Pilikan House, a living lab and demonstration model for energy efficiency and sustainable design, is on the same site. Nearby, the Lawrencetown site houses the Centre of Geographic Sciences (COGS), which is leading the way in geomatics-focused learning in Canada. Subscribe to our newsletter for business insight, analysis, and opportunities in the Valley. © 2018 – Valley Regional Enterprise Network. All rights reserved.